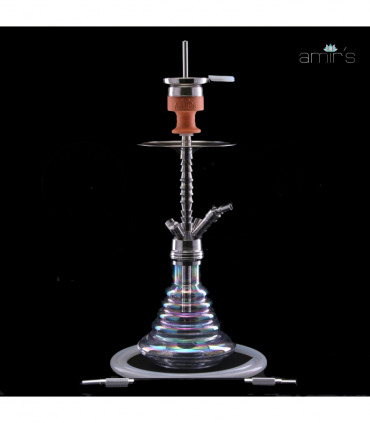 The Amir's Luxury Hookahs® 100R Shisha is a unique high-end stainless steel Shisha with rainbow effect in the glass vase. Insane draw and overall quality! Click-system and smoke chamber system for the stem. -Stainless Steel stem with 1 hose adapter but can be upgraded to fit up to 4 hoses at any time. Most Amir's® Shishas also come with a 2 year warranty! Would work with small LED module (little gap under the vase).